Also called Hound's Tongue in old herbals, describing the leaf shape. 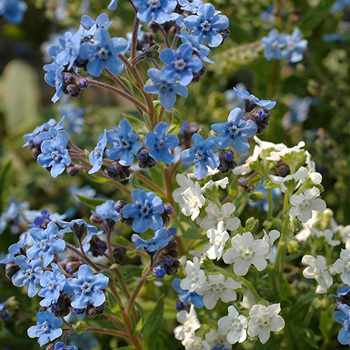 A long-blooming annual with abundant sprays of tiny flowers in true blue and white. Sow early for summer bloom. Self sows. Starting Indoors: Start indoors 6-8 weeks before last frost. keep at 65-70°F. Retain moisture by covering with plastic until germination occurs. Starting Outdoors: Direct sow in early spring 2-3 weeks before last frost or in autumn in zones 8-10. A good cut flower and a bee magnet, 'Chill Out'is at home in borders, informal meadow plantings, and for edging a border. It requires little care, just shear or remove after bloom to prevent an excess of self sown plants, replacing with a heat loving annual. Watering Details: Drought and wet tolerant, but prefers somewhat moist conditions. About 1" per week is plenty. Fertilizer: Does not need fertilizer. Plant: Stems of greyish-green leaves, fuzzy and lance-shaped, decreasing in size moving up the stems. Only the lower leaves have petioles (stem-like structures). Upper leaves are sessile, or attached directly to the stem of the plant. Seeds: Flowers will turn into nutlets, stuck together in groups of four, containing the teardrop shaped, prickly brown seeds, which like to stick to just about everything. The genus name Cynoglossum is derived from Greek words kyon, meaning "a dog" and glossa meaning "a tongue", in reference to the leaves. The species name means "lovely".